Today was the first full PMDD day of my cycle. I’ve been fighting off the creeping anxiety for a few days, but when I woke up this morning feeling like I was borrowing an ill-fitting skin, I knew the switch was about to be flipped. Fast forward a few hours and I was lying in the fetal position crying over Blue Whale statistics. PMDD is fun like that. As I started digging around in my PMDD survival kit wondering which flotation device would get me through this round of depression and anxiety, I realized I had started to amass a lot of them. So, why not share them here? These are the non-medical things I use to get myself through those weeks of hopelessness. Obviously, these are tricks that work for me personally (and even then, they don’t work for every bad episode) and there are a lot of people out there that will know a whole lot more than I do, but I wanted to share them all the same. If nothing else, it will serve as a time-capsule if I ever want to look back on my “treatment” in the future. And, who knows? Maybe you will have some new tricks for me to add to my kit as well. Track everything, including menstruation, symptoms, potential triggers and the effectiveness of treatments. Make plans. Wherever possible, I schedule fun plans like holidays to coincide with my good weeks. I keep the bad weeks clear or full of all the tedious tasks I would rather not waste a good day on. If it’s an emotionally draining task though, I might time it for a good day so it doesn’t break me. Create light at the end of the tunnel. Marking down an approximate release date from your personal hell is cheery! I’m sneaking vitamins in under my “non-medical” category because my GP roles his eyes at me whenever I mention them. Can’t be medical if your GP refuses to acknowledge they exist! That being said, I’m role-playing as a lab rat here, please don’t take my word on anything. I started off by trying all of the vitamins that I had heard positive things about. They seemed to ease off my symptoms from the very first month (yay!) but now I don’t know which of them are actually helping and which are just mooching off their friends’ hard work (whoops!). My plan is to ease off one at a time until I can pick out any duds. Iron – Honestly, I can’t even remember whether this one is supposed to help with PMDD. I’ve always taken it for dizzy spells and low blood iron levels. Magnesium – Another oldie – I’ve used magnesium for years to prevent restless leg syndrome and migraines – but this Superpill helps with tender breasts, too. In other words, magnesium is my best friend. Calcium – If it doesn’t work for PMDD, who’s going to complain about strong, healthy bones anyway? I’m not the greatest at this one. I’ve done a fantastic job at removing toxic, draining people from my life but, unfortunately, I’ve done a fantastic job of removing the rest of them, too. Being the human equivalent of a hermit crab is the best most of the time, but it can make things tough when you need to call on your non-existent support group. Luckily for me, I have family, and those suckers are still stuck with me. I’d rather minimize the amount of shrapnel they take with each PMDD episode though, so I’ve put some strategies in place to support my supports. Remember that calendar? Giving my support system the dates that I will be UFPS (Unfit for Polite Society) ahead of time gives them the chance to plan accordingly (ie. approach me with a Big Stick and oven mitts). The Werewolf Early Alert System – This one was my mum’s idea. I can’t always rely on my body to behave itself and follow the PMDD dates it has agreed on, so this cunning system allows me to warn my mother when I’m out for blood (har har). It’s pretty complicated: if I’m getting close to my bad days, she texts me before calling; or if I start to feel less human, I text her with a wolf GIF or meme. This way I don’t have to talk if I’m not up to it and she doesn’t lose any more fingers. Letters from your past self – Okay, I’ve only done this one once because I’m a forgetful procrastinator, but it’s a good one. On my good days, I write a letter to my partner reminding him that he is wonderful and I love him. He’s not allowed to open it until I start acting like an ice-queen, at which point past-happy-me can swoop in and give him the moral support that present-PMDD-me cannot. Music & Headphones (AKA the only way I get any work done) – I love listening to music and podcasts when I draw on a normal day, but on a bad day it becomes essential. By plugging my ears with music, my other senses dial down and the darker thoughts are harder to hear. Books – Where music cannot help, these guys will. Novels are great for escapism, but they work best if I’m already engrossed in a book before I hit a bad day. Once that happens, it can be hard to quieten my mind enough to get into a new book. Notebooks – Sometimes just jotting down a list of the things I need to get done or I am worried about can stop me fretting that I will forget something important. Anxiety can make you feel like you have a million things to worry about, but writing them down helps you see how unrealistic that is. Also useful for spells of brain fog. Sensory overload and brain fog mean I can’t handle people on my bad days, so I become a workaholic instead. Obsessive immersion in a project lets me avoid eye contact and turn my restless PMDD energy into something positive. Usually, this means writing or drawing. Sometimes it is less rational, like my paper-making phase or the time I bought 50 succulent cuttings (and no pots or potting mix). Today my project is this blog post. This is all about covering my space (and myself) in things that remind me to keep going. This includes my kids’ art, photos, and work from artists I admire. I have some pieces of jewelry that I wear on my bad days to remind myself that, just like taking my earrings off at the end of the day, I will soon be able to strip away the darkness. My favorite reminder is my tattoo which represents aspects of my children, my life and my mindset. Shout out to my lovely tattoo artist, Ruby Scanlon! This is somewhat self-explanatory – I use a carrot to lure myself to the end of each day. But not an actual carrot. My rewards for surviving a bad day include wine, chocolate, face masks, and bath bombs. These rewards focus on taste, smell, and touch to help salve my overloaded senses. Aromatherapy and a long, hot bath also help with a good night’s sleep, which gives me a slight advantage when it comes to picking my sword back up the next morning. Even someone like me can benefit from crawling out of their cave and enjoying the sunshine. Everything feels more manageable in the fresh air. Exercise is a little trickier because I intentionally sabotage myself on bad days, so it helps to build up the habit on my good days first. If I can manage to suppress my thoughts long enough to get some exercise, it lets me burn off some jittery anxiety energy. I wrote most of this post in my notebook while I was in the bath, drinking wine and listening to music, so sometimes these tricks really do help. But the day after I wrote it was one of my worst days this year. It was dangerously bad and I just wasn’t coping. I’m telling you this because sometimes all of the tricks in the world won’t push away the darkness. Those are the days when you have to grit your teeth and be stubborn. You have to tell yourself that you’re not giving up, that if you have made it this far, you can make it through one more lousy day. And you do make it through and you become all the stronger for it. Then you add that strength into your survival kit for next time. If you’re looking for PMDD support groups, resources or information, please check out The International Association for Premenstrual Disorders, Vicious Cycle and Me V PMDD. 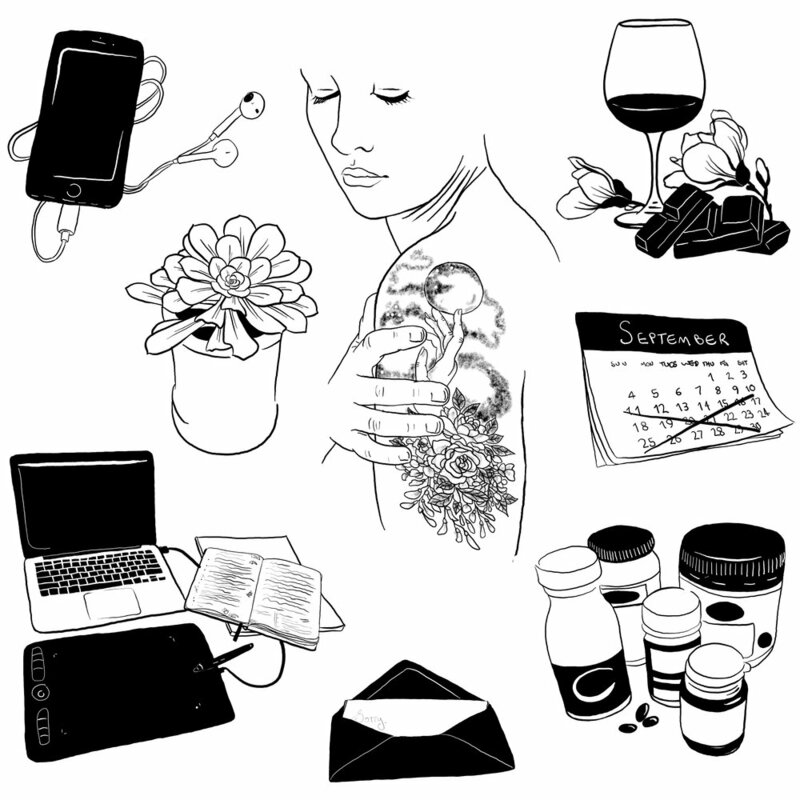 Dominique Rose is an artist that writes about her life and experiences, including her battle with Premenstrual Dysphoric Disorder, on her blog, and sells black and white illustrations and imaginings in her Etsy shop – Inklining.